This majestic 13 star ship's flag dates to the middle of the 19th century, with accompanying history indicating that the flag was flown in 1876 during the Centennial festivities in Kennebunkport, Maine. Thus the flag dates to at least this period, though dating the flag precisely is somewhat challenging. The flag is in immaculate condition. The wool bunting of the flag has virtually no soiling, and looks just like the day it was woven. In my experience, it's unusual to find a flag in such immaculate condition, especially considering that it clearly has seen use. There are several repairs on the flag, including double-reinforced patches which are a hallmark of maritime flags, as well as areas of wool darning. The entire flag is hand sewn, with large single-applique stars. These construction techniques are uncommon for a flag of the Centennial era, though there are known examples, such as IAS-00109, which are of the same type of construction and which positively date to the period circa 1870. The hoist of the flag, which often provides additional clues to the age of a flag, is missing, and the hoist end has been turned back and carefully hand stitched. The flag is somewhat large, nearly 11 feet wide, but it was not uncommon for ship's flags from the 19th century to be much larger, often more than 20 feet in length. In fact, this flag is actually considered medium sized and even on the small side for flags of the era. The 4-5-4 star pattern is highly coveted and rare. It is one of the earlier patterns known to be used on a American flags, with documented evidence of its use dating to the late 1700s. At the time of the Centennial festivities in Kennebunkport when the flag was flown, the flag was correctly described as "resembling a Naval flag used by the privateers of 1776." Until further research is done on the material and thread used in the flag, narrowing the date range for its origin is difficult. 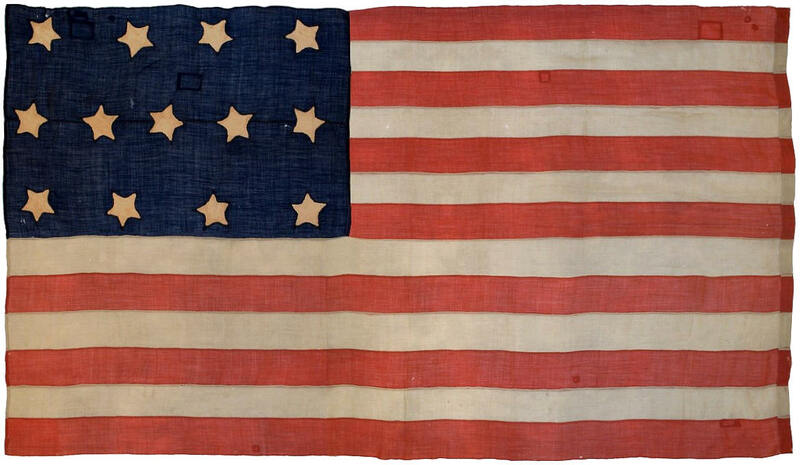 Without question, though, the flag is as it was originally described--it is in precisely of same style, materials, form and construction of a original 13 star American naval flag of period circa 1780-1790, and it is a gem example of a 19th century American ship's flag in the rare 5-4-5 pattern.